Since man first found he could sharpen a stick to defend himself, we’ve realized the importance of good quality tools in making our life easier and more bountiful. In our search for better and better tools and weapons, wood gave way to rocks tied to sticks, that were in turn replaced by chiseled pieces glued and fastened to hardy handles. Whole communities came to rely on those that could turn their hand to working stone, to people such as Otzi. Otzi was the finest stone-shaper in the village; the tools he produced bit deep into soil, fell trees and boars alike with ease, and chased away many a pillaging group. They were the zenith of the day’s technology, underpinning every field of human activity, from agriculture to crafts, to battle. And today, grasping an axe that he himself chiseled, standing next to his fellow villagers, facing strange people from stranger lands, Otzi was prepared to defend his home once again. But as battle raged and stone splintered on the invader’s weird, reddish weapons and armor, realization crept over the defenders; stone was no longer king. The age of copper had begun. Copper is widely believed to be the second metal (after gold) that humans learned to shape and utilize. It was more easily encountered and obtained than other metals as it forms native element bodies throughout the crust, and archaeological consensus places its discovery at 9000 BC somewhere in the Middle East — though like agriculture, it was most likely discovered independently by several groups of people. A lot softer than iron, with 3.0 on the Mohs scale compared to iron’s 4.5, and very malleable, the metal could easily be beaten into shape and if done at room temperature this would create more durable edges as the metal’s crystals aligned to the mechanical stress. 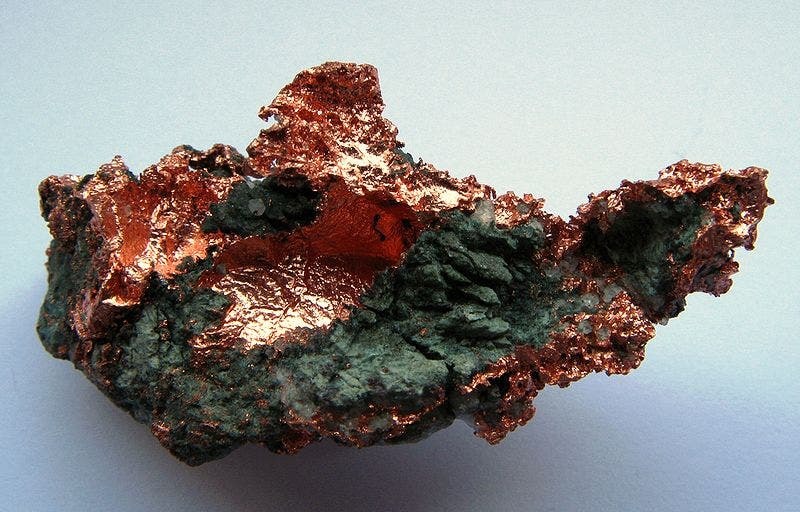 Being easy (compared with other metals) to mine and process but more durable, malleable and less brittle than stone, copper started replacing it as the material of choice for tools, weapons and other objects. However, as limited people had knowledge of the metal or how to work it and as it was fairly expensive, stone remained the most used material throughout the copper age. Still, this was little comfort to the peoples that were enslaved by more technologically advanced tribes and empires, in part due to lacking the adequate weapons to defend themselves, such as our hypothetical Otzi. Elemental copper was the first source of the metal that humans used, for obvious reasons — it’s easy to find and doesn’t need much refining. If a big enough chunk was found, all you had to do was hammer it into whatever shape you needed. However, this is limited by the size and shape of the nuggets miners were able to find, and there wasn’t any way of making sure there weren’t impurities in the metal mass, that could ruin the final object’s properties. As copper deposits were exploited over time, such pieces of metal were increasingly hard to come by, so craftsmen started melting together smaller bits of copper into bars that they would then turn into finished products. Most copper nuggets are found in this size. Experimenting with melting the metal, smiths learned that they could treat copper to have different properties, depending on what they would use it for. 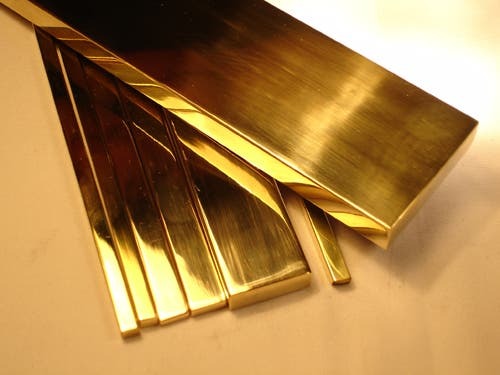 If you took a copper bar, heat it up and let it cool down slowly (a process known as annealing), the metal’s crystalline structure would arrange in a more homogeneous structure and the copper was much softer and easier to shape, good for jewelry or coinage. 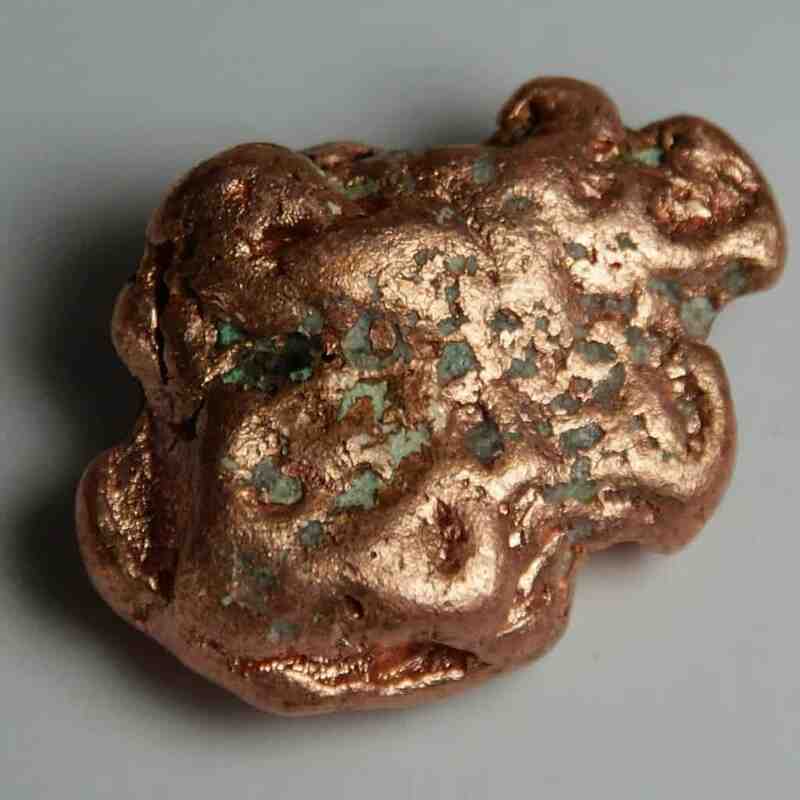 On the other hand, cold-processed copper had a more arranged crystalline structure, harder than the annealed metal. Tools and weapons were shaped this way, to make them more durable and allow them to keep a better edge. 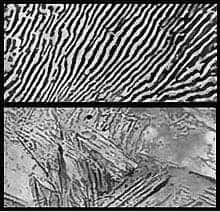 While steel is an alloy, copper crystals behave similarly to heat treatment, with cold-shaped pieces showing the same internal stresses between crystals, helping them hold each other in place. After deposits were depleted of most native copper bodies, smelting was employed to extract the metal from its ores. Early smelters were very primitive, so in these early days of metallurgy, only the most worthwhile material was processed. For example, some of the first recorded smelters were employed by the Sumerians, and they were no more than shallow pits in which ore was thrown over burning charcoal. Exactly how they reached sufficiently high temperatures in the absence of bellows is still a matter of speculation — one theory holds that the smelters were covered with clay, leaving only an opening towards the prevailing wind to feed the fire. Hieroglyphs show that the Egyptians also had this problem, but solved it using a long tube to blow air into the furnace. This is another major turning point in our history that copper brought about. Smelting involves much more than just melting the metal from the rock — it’s a delicate chemical process, requiring the use of a reducing agent to scrub the metal atoms of oxidizers (most often carbon in the form of charcoal that releases carbon monoxide as it burns, then pulls oxygen atoms from the ore, forming CO2) that usually bind to them, and flux is used to purify the melt. Smelting was probably developed over a long period of time, with small improvements being added over time to the procedure. But without a metal useful enough to impose itself in human society, that could be found both in native and ore forms, smelting might have never been developed. 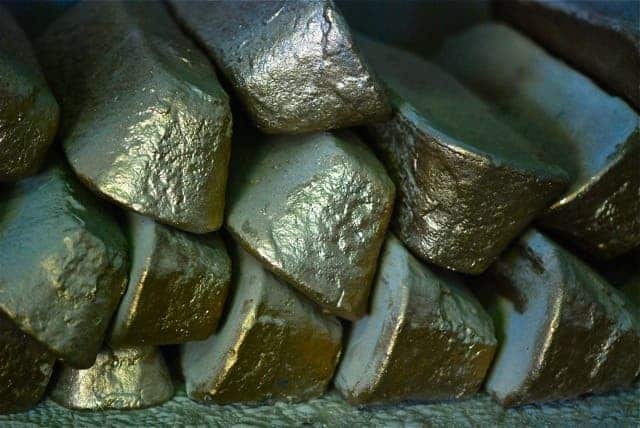 And without smelting, other metals such as iron or aluminum would have never been discovered and used. In the later part of the Copper age, as technology advanced, casting was employed on a wider and wider scale as a production method, especially for works of art such as statues or jewelry, for religious objects and some tools. This process required skilled craftsmen, as it is quite difficult to do with copper because of the formation of gas bubbles during the pouring of the metal and its shrinking when it cooled down. Ok so now we have a pretty good idea of how copper was extracted and processed in the beginning, but how exactly did the discovery of metal (especially one durable and abundant enough to rival stone) impact the lives of people? In a time where virtually all labor was muscle-driven, having access to a material that can make your tools bend a bit instead of breaking — but that’s ok because you can totally hammer it back up — or make your sword shatter an enemy’s weapon was like playing life with cheat codes. This is why we tend to create chronologies (Stone age, Iron age, etc.) based on how widespread the use of some such material was in a certain region. During the early stages of an age the use of the new metal was still infrequent, but became widespread during the middle stage and common in the final period, and the impact on societies should be viewed with this in mind. One of the most distinctive societies of prehistoric Cyprus (the island from which the name of copper is derived) was the Erimi Culture. Mainly fishers and farmers throughout the Paleolithic, during the Copper Age the Erimi experienced a huge population increase, an explosion of arts and crafts but most importantly — the creation of social hierarchies. People loved it; they used it for everything, from nails to pans to roof tiles, statues of gods or demons or pretty young ladies (hopefully) — if they could afford it. Villages grew in size and were fortified, with large houses and high-status goods denoting differences in wealth and position. 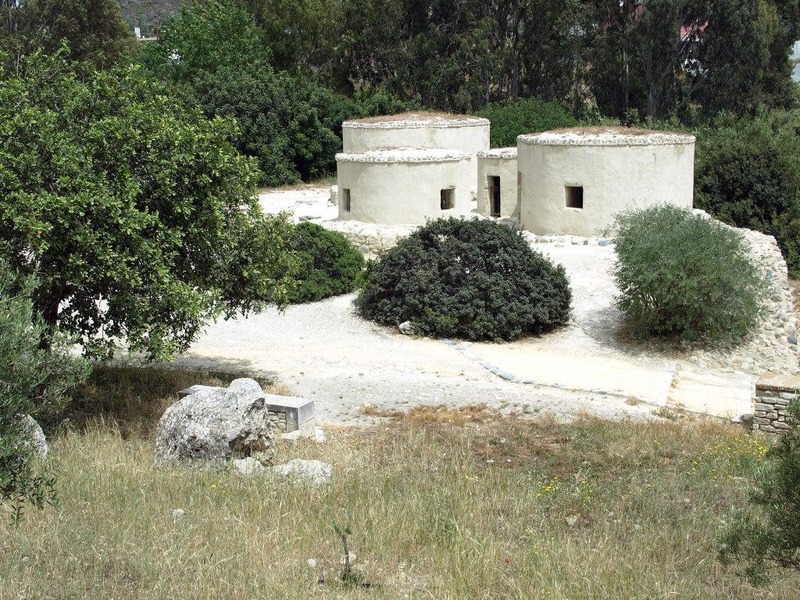 Grain storage and food preparation became private rather than communal, as it was in the earlier villages. Reconstruction of an Erimi house. With access to better tools, farmers — most of the population — were able to produce much more food than they required to feed themselves; those that had access to copper — few in number — would sell the tools, the weapons and miscellaneous metal goods that the community required, turning a sweet profit for themselves. Trade flourished both internally and with other peoples, and as the Erimi accumulated wealth, they had more and more time and resources to spend on arts, culture and science. 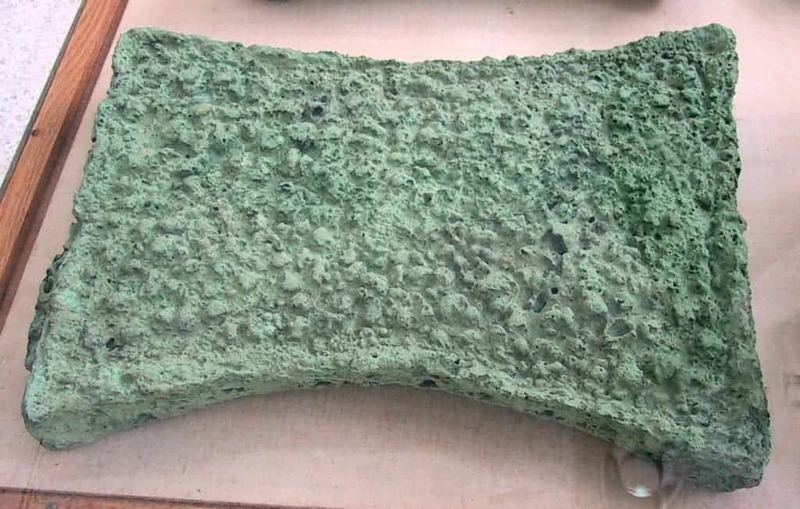 A typical copper ingot in the late Chalcolithic, meant for export. This trend keeps around the globe — as groups discovered copper and the means to extract it, they experienced (with some exceptions) huge demographic, economic, and cultural explosions, with social layers or hierarchies being cemented during this period. Sometime in the late Chalcolithic, someone figured out that if you melt copper together with another metal such as arsenic, it becomes harder, more resilient and altogether better at everything people used copper for up to them. Exactly how this was discovered is still a matter of debate, but since copper ores are naturally contaminated with other metal, such as arsenic and tin, it’s likely it was discovered by chance during smelting. No matter how the alloy came to be, it quickly started replacing copper wherever it was available, just as metal once replaced stone. Most artifacts retrieved from the Bronze age are made up of a type of copper alloy called brass, a mixture of copper and zinc, known for its bright gold-like appearance. 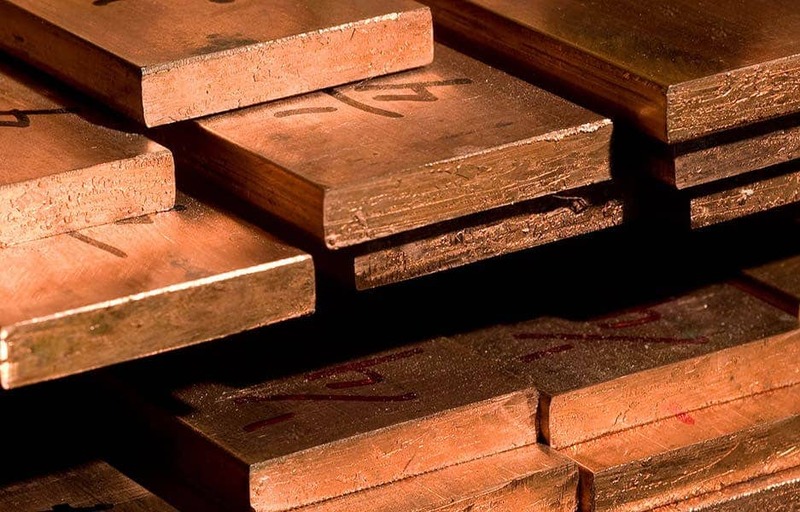 Although it lost its monopoly on human metal industry a long time ago, copper is still one of the most valuable and sought-after metals even today. Its resistance to corrosion, thermal and electrical conductivity, ductility and malleability make it irreplaceable in a wide range of industrial sectors, from plumbing to electronics. It’s so valuable to us that up to the 20th century, Sweden was known to have a “copper backed currency” — a mine in Falun, known as the Great Copper Mountain, operated from the 10th century to 1992, produced two thirds of Europe’s copper demand in the 17th century and helped fund many of Sweden’s wars during that time. But no matter how useful it is, or how profitable it is to trade, in my opinion the real value of copper is that it thought us how to shape metal. It freed us from the constrains of wood, bone, fibers, stone and gave us the means and knowledge to produce tools and technologies powerful enough to shape the world around us.